Editor: Lynne Namka, Ed. D.
A Gathering of Grandmothers – The Wit, Warmth and Wisdom of Feisty, Older Women. So who are you now that you have lived the first fifty years of your life? Who are your role models for becoming a healthy older woman? What rites of passage assist you into your Feminine Elderhood? Are you living your passion? Who are you becoming? Who do you want to be? This anthology addresses becoming ones true self in the second half of life. The stories are written by women celebrating their aging through connection to two national womens movement groups. The Gathering of Grandmothers and The International Council of Crones. Wildly-different women, ages 50 to 101 who have found richness in their aging process, share their wisdom. They write about aging with zest and enthusiasm with much to give to older women and the younger generation. They share a collection of laughter, stories, poems, dreams and visions, fairy tales and wise sayings. These are pioneer women working to change themselves and the world. You will find originality, creativity, and meaningful pain in their stories. You will laugh and cry at these gutsy, opinionated women who have something to say about the deeper essence and mysteries of life. 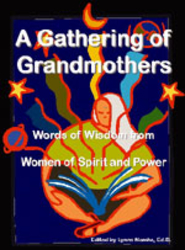 A Gathering of Grandmothers: Words of Wisdom From Women of Spirit and Power is a collection of stories, poems, wise sayings and visions and women supporting each other in the later stages of life. It speaks to the rite of passage of women moving into the second half of life with grace and wisdom.